Donald Duck #7 (legacy 374) came out earlier this month. 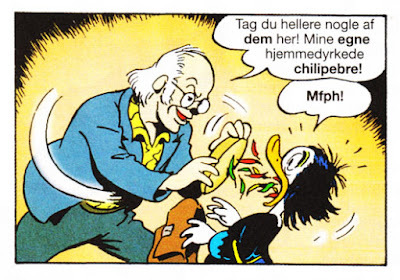 The main story is Truth or Consequences, written by Lars Jensen and drawn by Flemming Andersen. It's the 6th story in the TNT (Tamers of Nonhuman Threats) series, the first five were published in Gemstone’s Donald Duck Adventures about 10 years ago. The stories work fine as individual stories, but if you are unfamiliar with the series, I would recommend trying to track down the first story before reading this one. 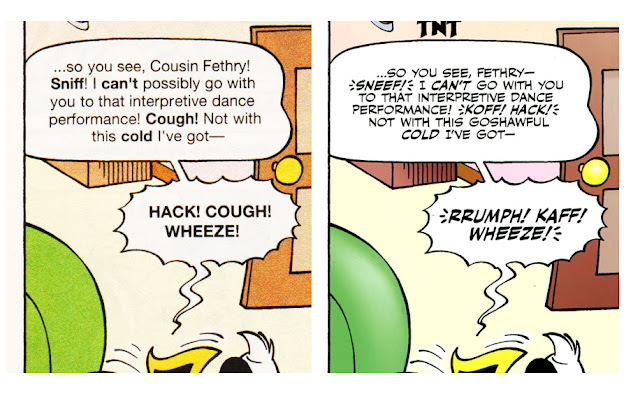 It’s actually not the first time "Truth or Consequences" is published in English. Egmont in Europe have a series of pocket books in English that is published in several countries, and this story is in one of them. 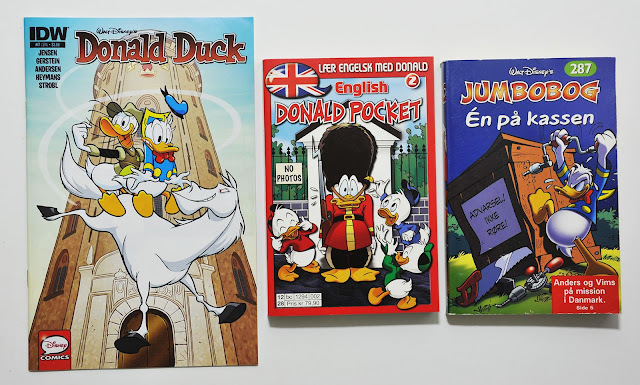 The purpose of the books is to learn English, the pages have selected glossary with translation at the bottom and the Norwegian edition of the series is offered as class packs to schools. Some books from the Norwegian edition of Egmont's English pocket books. 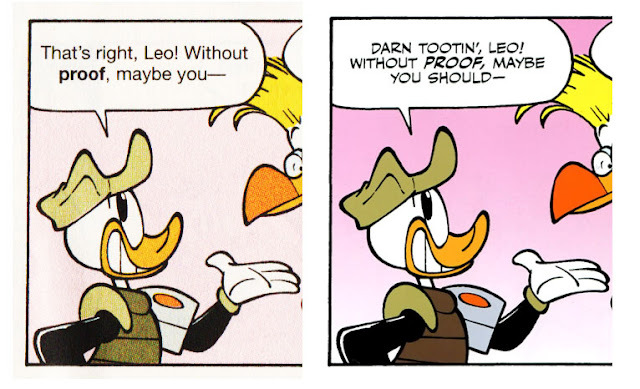 I believe the text in these books is close to the original script, so I thought it would be fun to compare with the American print to see how the dialogue is localized. 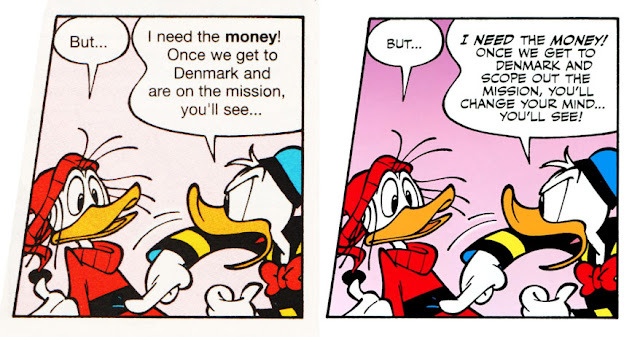 As most of the story takes place in Denmark and I actually have the Danish print of this story too, I did a couple of comparisons to that translation as well. Can someone explain the "jumping jacks/jumpin’ jacksnipes" expression to me please..? In the next example, I wonder what the original script is. Two street names in Copenhagen, "Landemærket" and "Købmagergade" are used the American and Danish text, but not in the European-English print. And it seems the text box have been slightly enlarged to make space for the names. 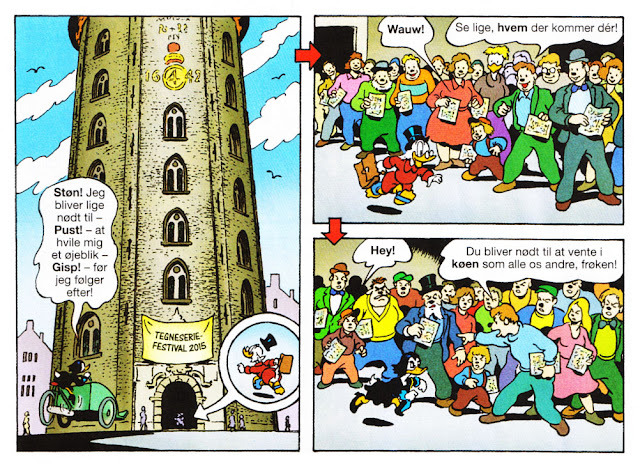 In addition to Rundetårn (Round Tower) where part of the story takes place, there are a lot of other famous real-life buildings in the story. But for a Disney fan, the last panel have the most important one, it’s outside the Egmont office in Copenhagen! 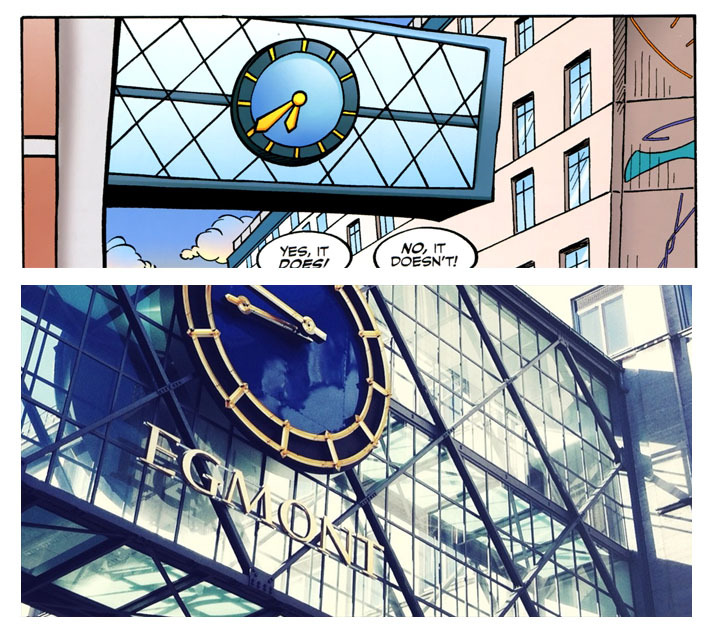 The week after "Truth or Consequences" was published by IDW more action happened in Rundetårn, both in real life and in the comics. 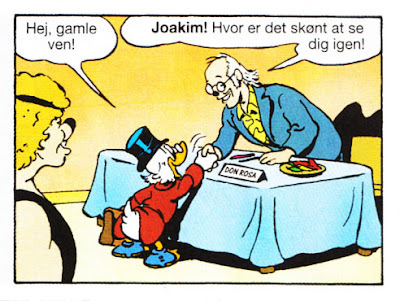 The Danish comic festival "Art Bubble" was held inside, and one of the guests was Don Rosa. 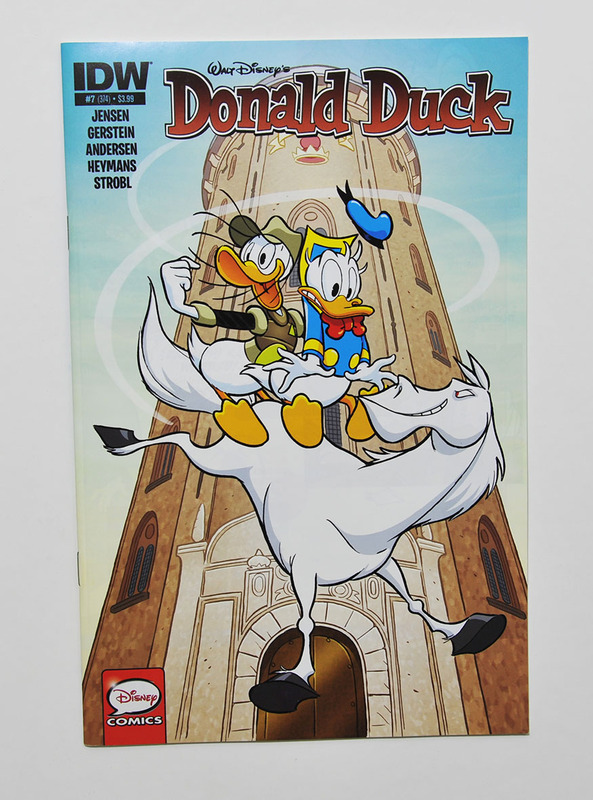 The tower was again used on the cover of the Danish weekly, with Scrooge, Magica and Don Rosa (!). And the poster for the festival also had the tower with various Disney characters. If that wasn’t enough the Danish weekly even had a story inside featuring the tower AND Don Rosa. And the "money shot", Don Rosa is shoving his homegrown chili in Magica’s beak. The IDW edition of "Truth or Consequences" is very close to the original script—we added just a little extra wordplay for American readers. 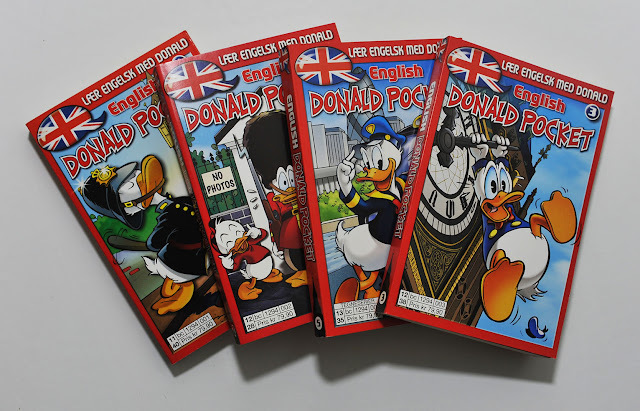 The European English pocketbook version is somewhat simplified from the original script (to avoid confusing beginning English speakers, I think)—with some wordplay and other details removed or condensed. 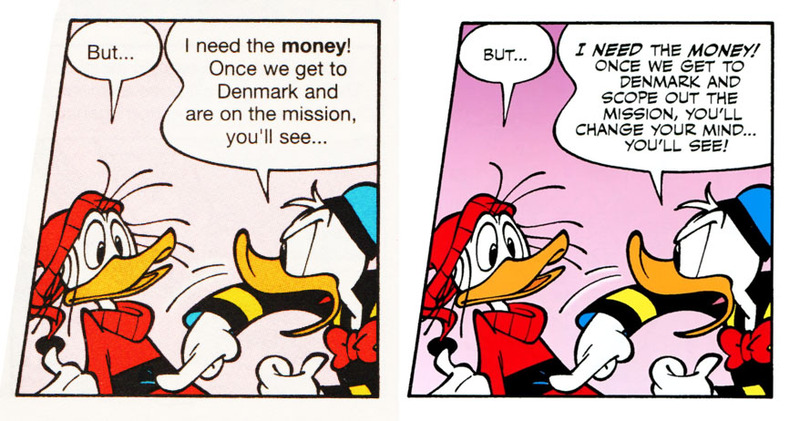 Ah, I started to suspect that when comparing to the Danish translation. The translation was somtimes closer to the IDW print than the English pocket books. 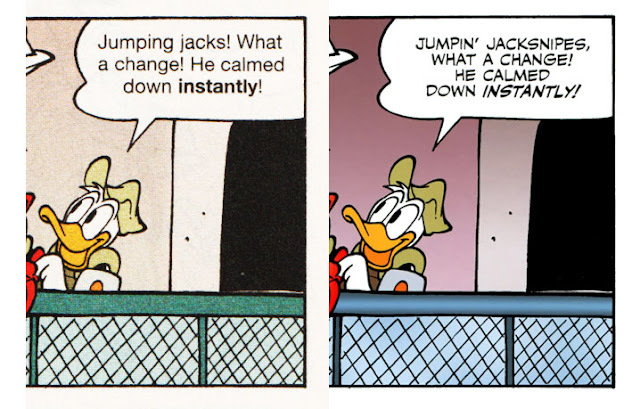 I would still love to know what "jumpin’ jacksnipes" means :) I've never heard that expression before.